Today, our firm filed comments with the Food and Drug Administration (“FDA”), criticizing various parts of the FDA’s new “Draft Guidance” with respect to dietary supplements. Homeopathy 4 Everyone (“World’s No. 1 Homeopathy Medical Journal”) published our article explaining the latest chapter in the FDA and FTC’s war against homeopathic medicine. The article was written by Bill Olson and Jeremiah Morgan. Our firm filed comments on behalf of the United States Justice Foundation and The Senior Citizens League opposing efforts by the Food and Drug Administration to restrict access by Americans to homeopathic remedies. Today, we were asked to participate in an on-line symposium sponsored by Casetext on today’s King v. Burwell decision. In this article, we reviewed our arguments in the Supreme Court in King v. Burwell. Our comments on behalf of Gun Owners America, Inc. to the Department of Health and Human Services on proposed HIPPA rules were cited in an article by Stephanie E. Pearl, “HIPPA: Caught in the Cross Fire,” published in the Duke University Law Journal, vol. 64, no. 3, p. 559, 565, n. 39 (2014). Today our firm filed an amicus brief in the case of Daniel Chapter One, et al. v. Federal Trade Commission in the United States Supreme Court in support of petitioners’ petition for writ of certiorari. 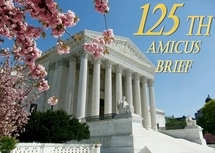 Our amicus brief was filed on behalf of U.S. Justice Foundation (www.usjf.net) and Conservative Legal Defense and Education Fund (www.cldef.org). The U.S. District Court for the District of Columbia denied the Daniel Chapter One (“DCO”) motion to dismiss, denied the government’s motion for a preliminary injunction enjoining defendants from violating the FTC’s order, and stayed the case pending resolution of DCO’s appeal before the U.S. Court of Appeals for the D.C. Circuit. Declaration of Karen S. Orr, D.C. The U.S. Court of Appeals for the D.C. Circuit denied the Daniel Chapter One (“DCO”) motion requesting a hearing on the DCO claim under the Religious Freedom Restoration Act (“RFRA”).